I searched my collection of chess images and found many more that featured CDVs, including another showing Morphy. These might be worth a future post. Mathew B. Brady (1822–1896) was one of the first American photographers, best known for his scenes of the Civil War. He studied under inventor Samuel F. B. Morse, who pioneered the daguerreotype technique in America. 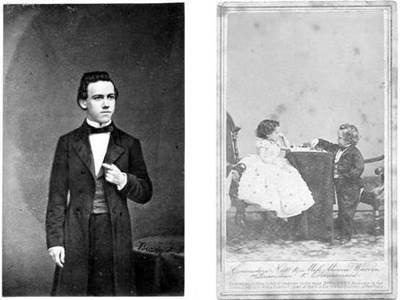 Brady opened his own studio in New York in 1844, and photographed Andrew Jackson and John Quincy Adams, among other celebrities. When the Civil War started, his use of a mobile studio and darkroom enabled vivid battlefield photographs that brought home the reality of war to the public. The Brady images below use different styles. Paul Morphy Chess Champion by E Anthony, Brady's National Portrait Gallery. Collection LM. Original rare carte de visite of Commodore Nutt and Miss Minnie Warren taken as the Groomsman and Bridesmaid to Tom Thumb and Lavinia Warren's marriage. The image shows the midgets playing chess from a Brady negative and published by E & H.T. Anthony of New York. On the front of the card below the image is the description and copyright: "Commodore Nutt & Miss Minnie Warren as Groomsman & Bridesmaid. Entered According to the Act of Congress in the year 1864 by E. & H.T. Anthony in the Clerk's office of the District Court of the U.S. for the So. District of New York." There are two initials embossed in the lower right and left corner of the image, the letters EA, lower left and FB in the lower right. The embossing makes this image one of the originals done by Brady and Anthony, c.1864. Wikipedia's page, Commodore Nutt ('George Washington Morrison Nutt; 1848–1881'), has further links for Minnie Warren et al.